ST. GEORGE – A home compliance check by Adult Probation and Parole agents Thursday resulted in four arrests after alleged drugs, paraphernalia and a rifle were found on the premises. Parole agents were going to see a probationer at a home in St. George in a visit that turned into a drug arrest roundup, according to a probable cause statement filed in connection with the arrests. One of the agents knocked on the door of the home for several minutes until Kiley Bentley, 26, of St. George, answered. Before this, agents had observed Bentley exiting the side of the house and then returning inside before they approached. When Bentley answered, the agents entered the home and began looking for other people in order to account for all bodies present as a matter of officer safety. The agents were told there were several people in the home, among whom were Kaillee Manuell, 22, of Hurricane, Melanie Allen, 24, of St. George, and Rene Adrian Quintanar, 28, also of St. George. One of the agents followed Bentley to a room in the northwest side of the home, where they had seem him exit from the home earlier. The agent observed Manuell, Allen and Quintanar leaving the room as he approached. As he neared the room, the agent could smell the odor of marijuana, according to the statement. The agent informed Bentley, Quintanar, Manuell and Allen that they were being detained due to the discovery of the suspected marijuana. Officers from the St. George Police Department were called in and helped the agents secure the scene and the individuals involved. Warrant checks produced outstanding warrants for Allen and Manuell. A search of the room where the suspected marijuana was found produced additional substances suspected to be methamphetamine, as well as paraphernalia. A Winchester rifle was found in a closet adjacent to the room. Quintanar also produced what agents described as suspected heroin and additional marijuana. 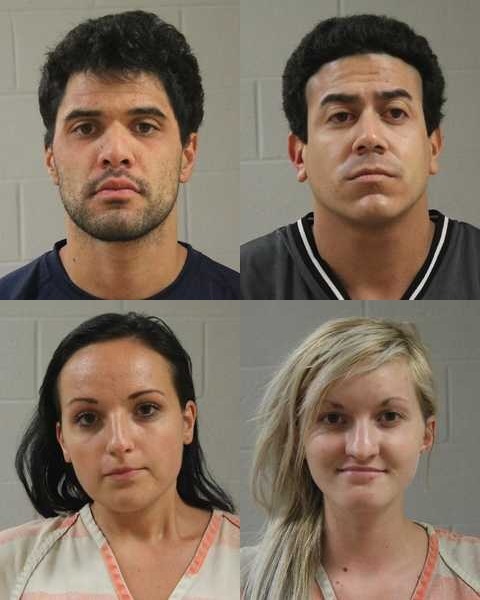 Bentley, Quintanar, Allen and Manuell were each booked into Washington County’s Purgatory Correctional Facility. Bentley was charged with three third-degree felonies related to drug possession, one third-degree felony for possession of a weapon by a restricted person and three class-B misdemeanors for possession of paraphernalia. Quintanar was charged with two second-degree felonies and one third-degree felony for drug possession, one third-degree felony for possession of a weapon by a restricted person, and three class-B misdemeanors for possession of paraphernalia. Due to previous convictions for drug possession, charges were enhanced, according to the probable cause statement. Allen was charged with one second-degree felony for drug possession, one third-degree felony for possession of a weapon by a restricted person and one class-B misdemeanor for possession of paraphernalia. She also had one outstanding felony warrant for her arrest. Manuell was charged with two third-degree felonies and one class-B misdemeanor for drug possession, one third-degree felony for possession of a weapon by a restricted person and three class-B misdemeanors for possession of paraphernalia. She also had two outstanding misdemeanor warrants.